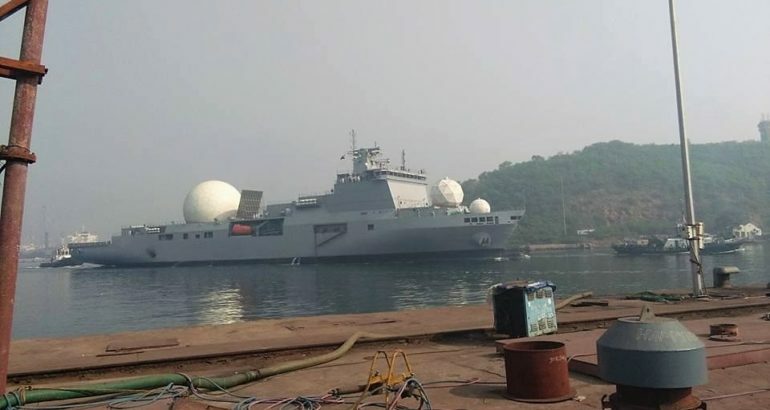 Latest picture of India’s secretive VC 11184 ship reveals that it has started its Sea Trial Phase and will be ready to be inducted into Indian Navy by end of this year. Construction of the ship began in 2014 under present NDA government and Hindustan Shipyard Limited (HSL) was tasked to be India’s first missile tracking ship worth 750 crores to be operated by National Technical Research Organisation, the technical intelligence agency working directly under the supervision of the Prime Minister’s Office and the National Security Adviser with Indian Navy. The ship which is still referred to as VC 11184 will get an official name when inducted but will come as a boost to ocean surveillance capabilities of the country in the region. Powered by two diesel engines, VC11184 can carry a crew of 300 and has a large deck which can accommodate a helicopter landing. Basin trials were already successful a while ago. The ship’s also equipped with hi-tech gadgets and communication equipment. Primary mission objectives of the VC 11184 will be to use its primary X-Band AESA Radar and secondary S-Band AESA Radar to track missiles in the region and second mission objective will be to spy and gather electronic intelligence from the ships which operate in the region.